This puzzle is excellent for those looking for a fun way to test the mental arithmetic of children. 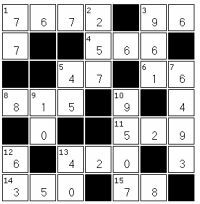 The puzzle is in the form of a grid, of varying size, containing a number of sums that cross over each other, with each sum labelled. In this way, the puzzle resembles the make-up of a crossword, although all the clues and answers are numbers! The puzzles require a range of sums to be done, these include addition and subtraction, multiplication and division. Some clues also require the ability to turn numbers written down as words to be converted into the numeric equivalent. The mental arithmetic required can be carefully tuned to make the puzzles easier or harder, and certain clues can be removed if required (eg division clues can be removed) or you could allow the use of a calculator with certain types of sums. These mental arithmetic puzzles are an excellent and fun educational tool, and are ideal for schools, parents, and educational publications or childrens / kids magazines and newspapers. If you would like to receive a sample puzzle then please let us know. We can always customise the size of the grid and clues for your requirements - for instance for 'advanced' arithmetic we can even add clues that use other arithmetic operators too or simple algebraic equations. If you would like to purchase these puzzles, or any other childrens puzzles, please do Contact Us >> to discuss your puzzle requirements.